Sal Out is a minor recurring character in the WarioWare series. She is a singer popular in Diamond City. Beyond that, not much else is known about her. Her name is a play on the term "sellout," which is a pejorative term for an artist who sacrifices integrity in order to appeal to a wider audience. During her first appearance, Sal Out sung the song for the Mona Pizza commercial, accompanied by comments of Joe. For unknown reason, The Dinosaurs from the rival company Pizza Dinosaur sung in the latter part. Sal Out was briefly displayed in Mona's story on a large projection screen near a street Mona drove along. Additionally, the people who ordered the pizza Mona had to deliver watched Sal Out on television. The whole song is heard during Mona's stage, only interrupted by the boss stage "Skyway Highway" and the proximate Souvenir scene, then it repeats again. Sal Out is seen between the microgames. By winning a game, she cheers, but by losing, she falls on her face as the song she sings distorts a little. The song can be obtained as a souvenir, too. However, Mona's instead of Sal Out's face is printed on the record's cover. 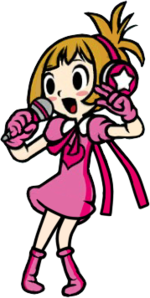 In WarioWare: Touched!, Sal Out reached #5 on Diamond City's music charts according to the television show "Ear Candy" with "Mike's Song." While only a very small portion of the song was heard during "Ear Candy" in Mona's story, the whole song was played as the background music in the first segment of Mike's story. Like in the previous game, a Mona Pizza souvenir with the Mona Pizza song can be unlocked again in WarioWare: Touched!. It can be unlocked by playing the game with WarioWare: Twisted! in the Game Boy Advance slot of the Nintendo DS. A video was added to the song where Sal Out is sometimes seen, but it's mainly focused on Mona and The Dinosaurs. Sal Out makes a brief appearance in the opening cinematic of Game & Wario along with her three background singers, the Chorus Kids from the Rhythm Heaven series, as well as in Mona's apartment during the beginning of Stage 1 and 3 in Shutter. In WarioWare Gold, Sal Out makes a cameo appearance on the cover of the Mona Pizza record. Additionally, during Penny's opening cutscene, when she talks about wanting to be a pop star, a picture of her wearing Sal Out's outfit can be seen briefly. Sal Out makes a cameo appearance in the Wario... Where? challenge set of Rhythm Heaven Megamix. She appears at the end of Super Samurai Slice, in which she replaces the princess at the end of the minigame.